Entering 2003, a good news came from Japan’s Bad News Records, the acclaimed EVEN STRANGER EP released in 2003, was turning into a surprise popular success. After touring the Land of the rising sun, Solea included Buffalo-based bassist Joe Orlando, and begin work on a proper debut album with producer and former Hippos singer/guitarist Ariel Rechtshaid. Solea’s eponymous debut album takes their indescribable sound to an altogether new plane. Songs such as Night & Day and Apotheke are richly textured yet remarkably direct, fuelled by densely layered arrangements and a straightforward rock sensibility. Immediate and irresistible, SOLEA is something truly rare in modern rock – music that simply cannot be pigeonholed. Will such a band be left free? They soon caught the eye of the world, Defiance Records in Germany, Golf Records/phd in UK, and Textbook in US were the winners to get the right in the end. Over the two and half years leading to 2004, much music was written for Solea’s sophmore album. However, being spread across the country and the temporary departure of Joesph Orlando (bass), the band didn’t exactly know how to play them together. In addition, frontman Klahn ‘s enthusiasm for Solea and playing music in general began to wane. Not really a great position to be in for a band that was fledgling, but had gained a bit of interest with it’s debut and multiple tours in America, Europe and Japan. Attempting to sustain momentum, guitarist Loobkoff (who wrote a majority of the music) and ex-Sense Field/Elliott Smith drummer Scott McPherson who joined the band after completing the album, grabbed their friend Rusty (from the Eels) and headed for the studio without Klahn. The result was amazing: they quickly hammered out 15 songs as if they had been rocking them for years. This is where the story gets frustrating. Plans to record Klahn ‘s guitar tracks and vocals (obviously the most important element of any Solea tune) were made and then repeatedly broken. 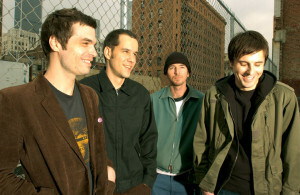 Finally, in august 2005 Klahn promised to finish singing as he was playing a solo show for the CMJ festival. Loobkoff and producer Ariel Rechtshaid flew out to New York, but for the 4th time couldn’t wrangle an album’s worth of performance out of Klahn. Then finally, in spring 2006, Klahn came to Los Angeles and finished his contributions. The result is actually kind of amazing. The record bears no evidence of any of the problems leading up to it’s release, it is a fluid, concise and catchy batch of songs. Perhaps a bit mature than the debut, Finally We Are Nowhere showcases Klahn / Loobkoff ‘s style of songwriting: melodic and poppy yet obviously from the roots of punk music. It reflects the tastes of it’s members, who mainly listen to sombre, mellow music but grew up with a soundtrack of loud, angry music; fusing the opposing styles into something special and unique. This brand new masterpiece Finally We Are Nowhere released in Japan on December 20th, 2006, was mastered by Mark Chalecki at capitol. After the release, they were invited to play a show at the opening party of live house MAO in Beijing, China, in February 2007, and then the Japanese music festival Independence-D in February. Riding the wave their release via iTunes in US, Japan, and Europe, and in November, Klahn played at Texas Is The Reason’s reunion show in NY.